Ant Control | Ant Exterminator | Westchester, NY. You may need an ant exterminator to help you take care of one of the most common pest insects you may find in your home. Ants are a difficult insect for homeowners to handle on their own. It is not the ants that you see in the home that you need worry about. 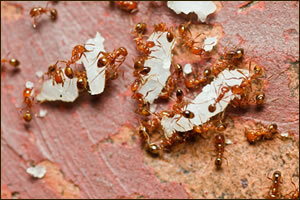 Scout ants and worker ants will leave trails in your home for the ants to bring food back to the colony. The colony is what an exterminator must find. This is where the majority of the ants are living. If a homeowner eliminates the ants they see, they are only treating part of the problem. QualityPro is trained to kill ants at the source. Ants can also build nests in walls, doors, cracks, basements, foundations, crawl spaces, insulation, bricks, eaves, and decks. QualityPro will inspect your home for signs of an ant infestation and apply treatments that are needs to keep ants out of your home. Some of the problems of self treating ants in your home is that the chemicals may not be safe for you or your pets. An ant exterminator will use the safest chemicals possible for removal of ants from your home or business. QualityPro knows how to get rid of ants. Ant exterminators can also treat the outside of your home. This will help to prevent ants from finding their way in. Some of the areas that QualityPro will check are trees, tree stumps, fences, and in the ground. Ants outside the home can cause damage by uprooting and cracking sidewalks, driveways, and patios. This damage is cause by the the ground beneath collapsing as they dig their tunnels. To have your ant problem taken care of sooner rather than later, call us today! (914) 712-6333 Put our experience in ant control to use for you!